E’s Art Direction: I want it to look like West Side Story in space, only make most of the Jets werewolf people with absurdly large guns. Ok, so two things that freak me out a little. 1. The werewolf(?) or should I say, teenwolf, on the left hand side is completely cross eyed. 2. That guys arm is huge! His elbow to hand length is long right? Could just be me. Oh, I know this one… the Backstreet Boys, right? …and I want the only human to look like Ryan Reynolds and Seth Green had a love-child. @THX – you’re right. That’s one of those tiny keyboards slung on Human Boy’s shoulder. Do you think they’re compensating for something? Wait a second, I’m pretty sure those are just M16s with orange attachments those werewolves are holding. 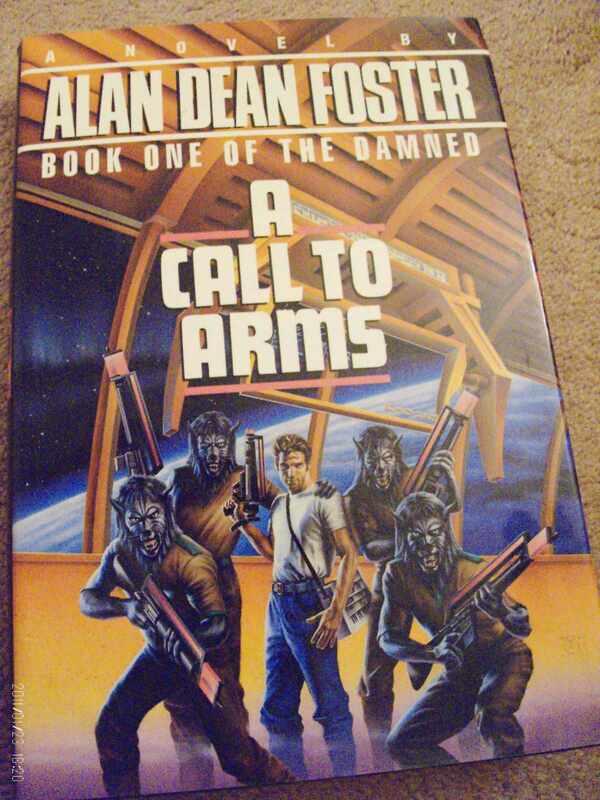 Because, you know, space werewolves have to rely on their cache of weapons from the 1960s. Also, the human’s gun kind of looks like an mp5 navy minus the magazine. Boy, the Shangri-La’s are getting long in tooth. I have to say though, I like my werewolves with t-shirts tucked into their jeans! From a distance, those wolfy creatures look like rebellious gorillas from CONQUEST OF THE PLANET OF THE APES. You know, the ones with the cheap over-the-head ape masks, because they could no longer afford the latex prosthetics of the earlier films in the series. Speaking of cheap prosthetics, I think that is the only plausible explanation for the human protagonist’s disproportionate forelimb. The crosseyed wolfy guy is probably looking at a housefly which has landed on his vulpine snout. The cover is worse than it looks. The characters look like they’ve been crudely stuck onto the front because they *have*. They are *textured*. They stick out of the paper! I cannot imagine whose idea this was, but it was a really, really bad one. Surprisingly the next printing used a different cover, much more boring-typical-SF. Man, I miss the eighties. The “Don’t Ask, Don’t Tell What’s On The Cover” policy. Anyone with a dress sense like that surely is Damned! In the story it describes them as rodent like. I don’t think the artist read the book. I had no idea Dane Cook was starring the Teen Wolf remake! There’s a “Proportional Issues” tag missing for that guy’s ridiculous left forearm.